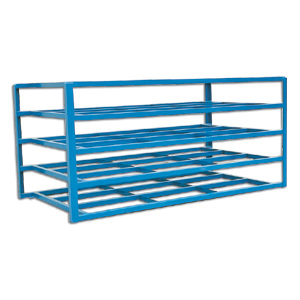 Buy horizontal sheet racks at low prices at Material Handling Solutions. Horizontal sheet racks are designed for storage of various types of sheet material such as sheet steel, aluminum and plywood. Storing these types of materials horizontally reduces warping and provides easy access. Our racks are made with 5 bays and allow generous space for materials of multiple thicknesses. 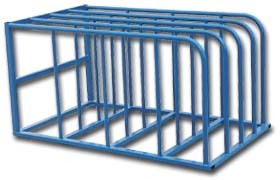 They are constructed of an all-welded steel frame and allows for 4-sides access. The shelf capacity is 2000 lbs per shelf. We also carry standard sheet racks. These racks are designed for vertical storage of sheet materials. Standard sheet racks come with 4 bays, have a capacity of 1500 lbs and a 10â€� distance between bays. Both types of sheet racks are supplied with lag down points. We offer many other types of material handling equipment. Please check out our large selections of various types of lockers and cantilever racks to utilize your facility's space to the fullest capacity. We have a huge inventory of pallet racks and we can usually quick ship any order within 96 hours. Call us toll free with any questions you may have and one of our specialist will help you find what you are looking for.